I've already introduced you to Olivia earlier with her red thread book. I knew we'd all want more from her, so without further ado, welcome back, Olivia. Hello, my name is Olivia and I'm a perfectionist. I remember coming home from 6th grade the first day I was labeled this way—I cried. I'm sure my mom helped me see the best in it all, but I have felt the sting of it again and again since then. I think with each experience, however, I've been able to "let go" a little each time. Katy has taught me a little about how to overcome this—though I doubt she even knows it. Just several weeks after the Dills visited Katy's parents in Korea, my husband and I did the same. I talked with my mother-in-law Becky about how Katy does it all—where does she find the time? (A question I'm sure you've asked yourself too?) Becky said she figured out the answer as she observed her: "She just does a little at a time. I just watched her—when we were on the subway, or any other time we even just had a few minutes to sit, she'd pull out her bag and just chisels away." I realized that's perhaps a reason I don't do more. I think I need to block out a big block of time before I attempt anything and guess what—those "big blocks of time" don't really show up. I came home from Korea with a hard few weeks ahead of me before the end of the semester. I was dying for free time. But I began to let the "Katy-wisdom" sink in: During final critiques, as I listened to my classmates, I started sketching what I wanted to create... get this... when I had a chunk of free time after finals. But at least this was a start! I remember recognizing a few 'down minutes' during the holidays while visiting my family and I just went for it. 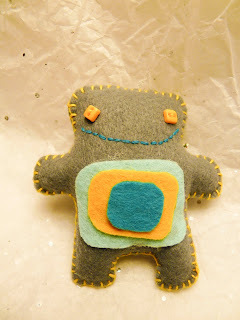 I Googled the blanket stitch, pulled materials together and monsters were born! So whether you actually make a little squeaker monster or if you're attracted to any of the other tutorials during Katy's Sewing Month, I hope you remember Katy's wisdom! If you're any kind of perfectionist like me, I hope you jump at the chance to conquer it! You're going to learn something no matter what. I sure did as I made this Dill monster, fumbling through mistakes even though I "have experience with them." You'll quickly see I don't have the seamstress knowledge that Katy does, but I guess this bring's us back to the Van Gogh quote that Kurt shared here. Here is a page of my sketchbook from the very class critique I mentioned last December. Felt, scissors, needle & thread, and your chosen accessories: it could be fuzz balls, buttons, charms, etc. I love these 'warm fuzzies' for some reason, so I'm using 3 of them this time; 3-eyed monster. You'll need something to stuff your monster—whether batting or cotton balls (see below). The glue gun is optional—if you don't have one, you could probably stitch the top pieces too. Oh, and squeakers. I bought this 6-pack with the rest of my Amazon order (SuperSaver shipping!) making them .58 each—simply search "replacement squeakers," or you can search this exact brand—KONG. easy stuffing, just two pieces to sew together and good room for the squeaker. 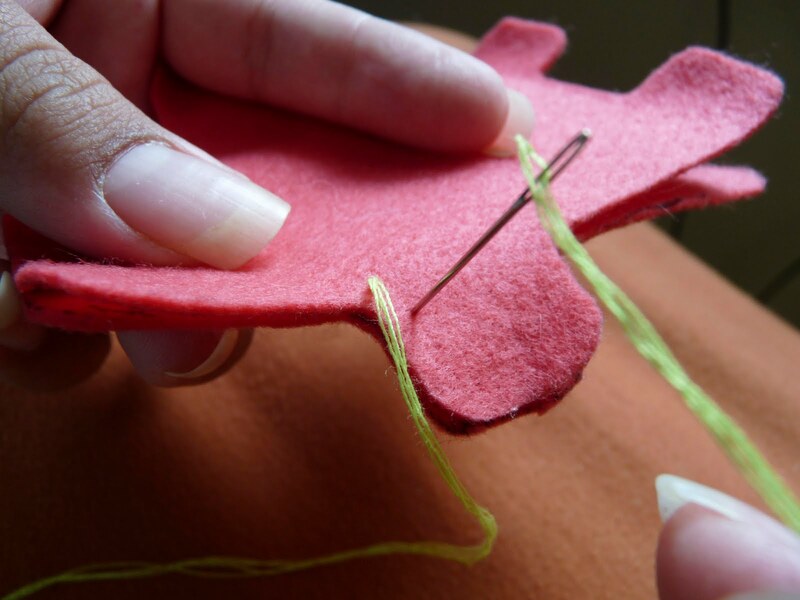 Like I said, I Googled the blanket stitch, so you can too. Start by coming up through just your top layer and go back down through both. Leave a little loop to bring your needle back through and pull. (You'll leave this a little loose so you can pull through it again at the end). Continue just poking through the front side and coming back through the loop. *Sure hope you are better at guessing the amount of thread you'll need—because stopping and starting this was a challenge for me. Maybe I should've Googled that better, too. But I just complied with "Fake it 'til you make it." Stitch all the way around but leave an opening for stuffing. The best spot to leave open is just under an arm. It's harder to stuff full to the edge you're stitching up last, so under the arm will be least noticeable. On this one I left the head open... easy stuffing, but left for a flat-ish corner of the head! If you are sewing on the eyes or anything else, now is the time to do so before the stuffing (is it really called batting?) gets in the way. I only stitched my pom-poms—originally thinking the thread would give them a "pupil" effect, but alas, after pulling they left only a dimple in the fuzz. No big deal— I'm challenging perfectionism! If you're gluing everything else, I would say stuff it a little first because then you can gauge where you want everything while seeing it "in 3D." I like some texture on the tummy so you're more inclined to press on the squeaker. So I like the layer effect. But this time I tried embroidery too. Another note: I'd have glued it onto the neon layer first though, seeing as the embroidery wasn't serving the purpose of attaching. *Special thanks to Katy for refreshing me on french knots. Can you tell that I rushed the first knot—on the right— before going back and reading ALL of Katy's instructions which helped with the knot on the left! My mom is a genius and suggested cotton balls since I was only making one small monster at the moment, and not up for the longer drive to the fabric store. (I know, 20 minutes is not really a long drive, but still, I considered my mom's advice life-saving.) If you aren't as lazy as I, batting will run you more bang for your buck and probably not be as prone to going flat, but then again, if you have cotton balls on hand, that's all the more reason you can start now! I pulled apart the cotton balls and used a pencil to help me stuff the limbs. I also wrapped the squeaker before putting it in. Finally, stitch up your opening. Above is my imperfect attempt. The final Lil' Squeaker—no big deal Dill. I don't always have to have the last word, you know, but I do have to say how very clever that Olivia is. And there's more. More?!? Oh, yes, there's more. Aren't these colors heart wrenchingly beautiful? You would expect nothing less from PurlSoho and their line of wool felt. Want some to make your very own No Big Dill Monster? i asked my son Leland (3.5) what he thought and he said " hey, a monster. i like his lots of teeth and little tiny monster hands. lets make a blue one. with, 1,2,3, funny eyes." so i think we're sold. MD is the proud owner of an Olivia original monster! i LOVE these Olivia. i think these will make excellent Christmas presents for my 6 nieces/nephews. i can't wait to create some! Monsterlicious! You ARE perfection, dear Olivia. That is so cute and cool! I've never seen those squeakers. Thanks for the great source! Oh very cute! Wish I had a little one to make it for/with. Maybe my 17 yr. old would like one. . .
these are so fun! I just made some with my kids, they had a blast picking shapes to go on their monster and now they are off playing and I have some peace. thanks! darling! 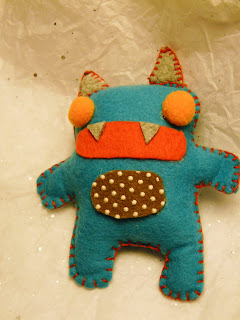 i will be occupying an 8 year old next week...by making crafty monsters!